Rainbeau Mars warm personality infuses this yoga practice with a subtle energy. The poses are perfect for beginners or relaxing for intermediates. As Rainbeau leads you through a flowing set of asanas the pleasant narrations is subtly calming. This is perfect for the end of the day when you want to nourish the body with breath. During the first 30 minutes you will be doing Cat/Cow, Downward Facing Dog, Child's Pose, Table, Moving Cat, Forward Bends, Low Lunges and Cobra. The session ends with a final relaxation pose or you can choose to do five additional poses shown from the front or side view. Rainbeau Mars invites you into a tranquil space where you can fully surrender into each yoga pose. Her escapes into pure focus demonstrate perfect techniques and she gives key pointers to make sure you are doing the exercises correctly with a sense of dedication. At times she starts talking about the movements slightly ahead of time, but this is OK because then you are well prepared for the next step. She has a beautiful spirit and never sinks into mediocrity. Each pose is perfected and performed like a work of art. The relaxing beach setting and calming music are perfect for a less active form of yoga. The session begins and ends in a seated position. There is a focus on spine twists and forward bends. Throughout the entire workout you will find yourself developing patience and relaxing deeply into the poses. As you surrender to gravity, ocean waves crash on rocks. There is a balance between the ocean's energy and Rainbeau Mars inner tranquility. As you nourish the body with breath, you gain a sense of calm to face life's chaos. Total Yoga "Water" begins with deep cleansing breaths and progresses into a flowing series of postures. The pace is perfect for beginners or intermediate practitioners, however there is an advanced pose called "Fish" that may present quite a challenge. What I liked most about this workout is the time given for each posture. When doing the Seated Forward Fold, they give enough time to relax fully into the pose. You may also recognize Camel, Boat, Triangle and Dophin pose. The mood is very relaxing with a desert setting and a backdrop of clouds. This workout leaves you feeling refreshed and relaxed as there is an extended session at the end where you can meditate and relax fully. 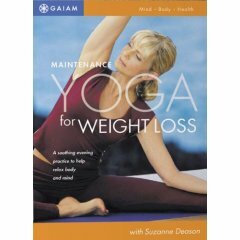 Maintenance Yoga for Weight Loss is a workout for the evening. There is also a bonus workout and the two sections work well together for a full-body stretch routine. Suzanne Deason's calming voice and nurturing teaching style makes this perfect for stress reduction. The beautiful beach setting adds to the experience and the emphasis on form makes you feel centered and balanced. During the first workout you will release tension in your shoulders and lower body. A yoga strap (or you can use a belt) is used to deepen the stretches. I found the use of an additional "yoga wedge" was not essential so all you really need is a yoga mat, belt and a pillow. While this routine ends with a final relaxation pose, you might want to skip that section and start the bonus routine. While you may feel completely relaxed after the first workout, the second bonus segment focuses more on breathwork. This short exercise routine has a meditative quality to calm the mind and body. You will recognize forward bends, bridge pose and warrior 1. Throughout the session you use breath to deepen each pose. The setting is very relaxing with a big open field near a forest in the mountains. Once you have finished both workouts you may feel a sense of clarity descending over your entire body. The exercises are designed to relax the body and are easy enough for beginners. Will this really help you lose weight? It may take a lifestyle change that includes walking and yoga to help you reach your weight loss goals. Recently I've found yoga to be an essential part of weight loss because it keeps me centered and focused. If you try to practice yoga on a daily basis I think you will be very happy with the results. Alan Finger's calming instruction style allows you to relax into each pose as you release tension and heal the body. Two yoga instructors show the exercises while Alan Finger guides you through each movement with a sense of precision. Deceptively easy stretches become a challenge when held for extended periods of time. Throughout the routine the body is calmed by breathing deeply. You may recognize table, cat, cow, downward dog and mountain pose. If you are intermediate you may want to do this routine to increase your patience. Beginners will be happy with the slower pacing and lack of difficult postures.